For the last ten years video has been a major component of my art practice. Since 1998 I have made over thirty-five videos that range from 15 seconds to 15 minutes each. These videos have been screened in film and video festivals nationally and internationally, exhibited as single and multi channel installations in galleries, museums and alternative spaces, and displayed online. Each day I seem to have a new idea for a new video. What interests me so much in this medium is its relationship with the human psyche. I am interested in exploring the formation and visualization of (my) belief system and thought processes, which are as fluid and ephemeral as video itself. This liquid connection to self in relation to a context relates to my multicultural background and experiences as well. As an artist, I negotiate, via a medium, my ideas and their manifestations, much like one translates one language onto another. The four videos shown here started an ongoing series called Motor, all of which are 55 seconds long (four more are in mid production right now). These short videos, about/around/despite/of Detroit, portray the figments of my imagination, the wanderings of my mind as I navigate in this paradoxically fascinating setting. in the city of ghost buildings, the body and architecture are compared. a first impression of a recent transplant citizen. attempting to speak french in order to (re) define myself. the immersion in water becomes a contemplation of a transcultural experience. personal history is fictionalized and (re) presented as a slide show. This entry was posted in 17 Days (vol.1). Bookmark the permalink. my favorite video is “french”; it starts out very simple like a children”s book. it seems very nice and silly at first, but when he says “i am not narrow, i am not straight, i am not Detroit” he is describing himself very well in very few words. He is acknowledging that he is not what is seen as mainstream beautiful, that he is not heterosexual and that he feel like he doesn’t belong in the place he lives, Detroit. The cinematography was interesting, using different filters to express the different feelings. The french section’s idea was a good concept. I feel that part of the video skips when watching it. The process of learning to the statement was a key factor. The nadar clip was also a good concept. Nada to nothing then Nadar for swim. The feel I got from it was when the subject was curled up in a ball they felt as if nothing. Of course there was a good play on words. I know that “nadar” means to swim in French (and Spanish), but my first thought was the French portrait photographer Nadar. I’m not sure if that was intentional, but it works (especially with the minimal, black and white look of the video) since Nadar believed that minimal backgrounds allowed for the true “self” of the sitter to come through the portrait, which is what Whitehead is trying to get at in away. I thought “French” was particularly fun. To define one’s self in coordination with location, but not necessarily the location to one’s self is interesting. There is a story line in the film “Paris je’tem” that is about an American tourist in Paris where she is able to define and understand herself by taking a vacation in Paris. I suppose that one way to understand yourself is to venture out into an unknown. I enjoyed Vagner Whitehead’s use of text within his videos. The words he chooses are very simple yet they have a big impact on the video, not only in its concept but as a visual too. I felt the most connection to the video Dead. The visual and the sounds are very stimulus. I believe that this work is understood on a different level when contemplating the area of Detroit and the issues of the artist, Whitehead, to be transplanted there. -opposed to viewing the pieces out of context- The series of videos are definitely a process of self-examination while in transition. The video, “Dead” especially strikes me and creates a mood as that is how I feel when driving through the old town that used to be so glorious. “Paradise” and “Dead” compliment each other well. However, the addition of all the videos in this series allow a lighter air and room for hope. There is an overall sadness to this work and that draws me nearer. I think I liked this video better after having read the comments. Heather, thank you for helping me connect the dots with death and Detroit. I also enjoyed the text overprint on the video. 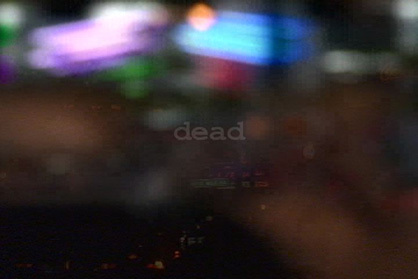 the layering in dead is very intriguing due to the body intertwining with the city lights to emphasize the statement about the body being like a city, very cool comparison. however, the sirens and text are very distracting. i really enjoyed nadar. the womb-like imagery helps me gain insight into what nothing is. before birth we are nothing in some respects. Also, the whole idea of how every aspect of life, no matter where or what culture, is intertwined is really mind blowing.